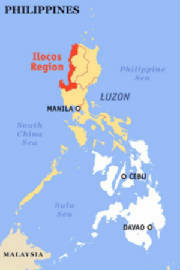 Region-3, also known as the Central Plains of Luzon, contains the largest plain of the Philippines and produces most of the country's rice supply. That is why it is called the Rice Bowl of the Philippines. The Region comprises of the Provinces of Aurora, Bataan, Bulacan, Nueva Ecija, Pampanga, Tarlac, and Zambales. The City of San Fernando, in Pampanga, is the regional center. Aurora was transferred from Region IV by Executive Order No. 103.